Another new electronic dice with smart features? Yes and no. Yes - YASD uses LEDs to display randomly generated numbers in a dice style. No - YASD is not in itself a finished product. It should rather show which printed circuit board technologies are possible. Microcontroller controlled generation and display of random numbers on an LED array in a dice style. The circuit contains an accelerometer. This sensor serves as a trigger for the generation of random numbers. The dice is no longer rolled, a simple tap on the dice or the table generates a random number. 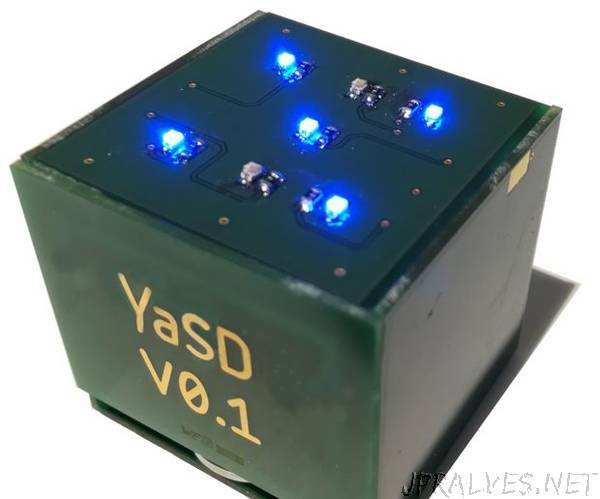 YASD is powered by a CR2032 coincell. YASD can also be configured with the accelerometer. For example, you can turn YASD upside down when switching it on. YASD recognizes this with the help of the accelerometer and changes to another operating mode. Energy saving mode.The generated random number is displayed for 3 seconds in a flashing rhythm. Then the display of the number on the LED array goes out.